The prolific waters surrounding Baja’s tip have captivated the interest of anglers from the four corners of the world since Baja sportfishing took root in the mid-1960s. Soon visitors traveled thousands of miles, eager to fish aboard the local fleet of pangas and the small cabin cruisers that were available. In order to entice the volume and size of fish found not only inside the Sea of Cortez, but also on the Pacific side of Baja, a dizzying array of rods, reels, and terminal tackle – as well as tackle boxes filled with a variety of lures and artificial bait in assorted sizes – was required. It wasn’t long before owners with their yacht/sportfishers from Southern California began venturing down the Baja Pacific Coast in the fall. They were eager to experience the warm winter weather and the rumored fantastic fishing everyone talked about at Cabo San Lucas, being careful to depart to meet insurance requirements before the summer storm season arrived in June. East Coast sports fishers, wooed by the tales of the bountiful variety and number of fish found in the waters surrounding Baja, were the first to join the visiting So-Cal fleet. They were quite willing to endure the daunting journey south, through the Panama Canal, before setting a northerly course uphill on the Pacific until they reached Cabo San Lucas – nearly 4,000 miles from their home ports. Today, many of the East Coast boats traveling to the Baja area have a simpler time of it. 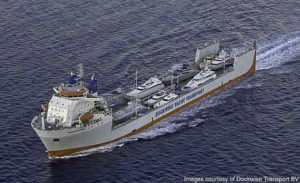 They arrive in the Pacific aboard huge transport ships, avoiding the wear and tear on the crews and their equipment. As the East and West Coast fleets began fishing together in the same waters, tackle and technique innovations were brought from their respective areas, compared and shared. Some were accepted, improved upon or discarded from each fleet, bringing the best of both worlds to the Baja fishery. Subtle differences still remain between individual boat’s tactics making them successful in this still-popular, still-bountiful fishery. Items that have been adopted by many of the fleet high-liners, becoming essential equipment for most of the serious charter and private sport fisher captains and crews. In 1909, George Farnsworth of Santa Catalina originated an ingenious, successful method of “skipping the bait.” By using a kite to hold the hook, baited with a flying fish at the surface of the water, the bait would appear lifelike. 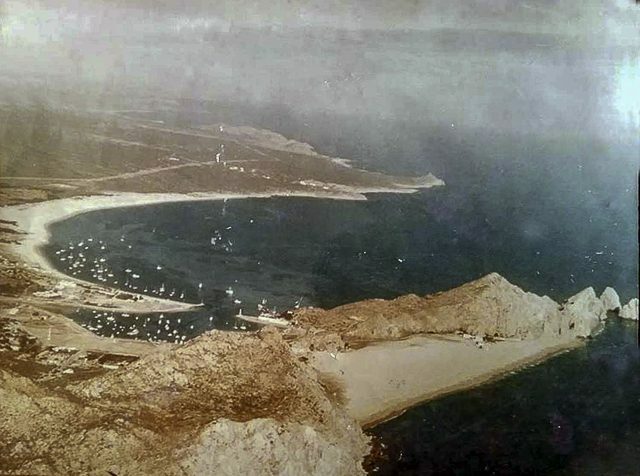 Over the years, the kite fishing failed to find acceptance on the West Coast, yet on the East Coast it became a popular method to target billfish and other species on the Atlantic Ocean. Decades later, captains and anglers have recognized their value in skipping bait or artificials farther away from the boat when targeting large yellowfin or bluefin tuna to be very effective. Tuna are genetically programmed to chase and eat flying fish instinctively. The original Yummy was a legendary style lure known for catching “cows” – yellowfin weighing 200- to 300-pounds – billfish, dorado and wahoo in the waters surrounding Baja Sur; they often succeed when all other lures and even live bait fails. The variations and color combinations are now available both on-line and in your favorite tackle store. Dredges are another method that attracts more fish into your trolling spread. Imitating a school of bait fish behind your boat with either artificial or natural bait, dredge fishing is a sure way to draw the attention of a wide variety of offshore fish. They have convinced many captains and their crews they are well worth the effort. Downriggers allow offshore crews to fish deeper zones near the banks, pinnacles, thermoclines and baitballs which target billfish, tuna, wahoo and dorado that often choose to feed well below the surface. At times, even the hungriest offshore pelagics simply refuse to move up through the water column. Often, however, when they exhibit this behavior, they will take a bait that’s presented at their own depth. 1. Good Downriggers: Both Cannon and Scotty make downriggers that have the torque and speed required to lift a 20-pound downrigger ball from the depths in a hurry. I load my downriggers with 200-pound spectra to reduce the blowback and avoid potential kinks in the factory loaded stainless steel cable. Spectra also removes voltage from the equation. 2. High Speed, High Capacity Reels: When a fish takes the bait and releases the line from the DR clip, there will be a fair amount of slack that needs to be reeled up, especially when fishing deep. In order to keep up with the fish and make my bait/lure checks more time efficient, I use the Fin Nor-Marquesa in the 12 and 16 sizes. These reels pull multiple duties for me including live-baiting tuna and inshore bottom fishing. The drags are super smooth and the gear ratio is a speedy 6.1:1. I love lever drags for salmon fishing as I can single handedly stack two rods on a downrigger, drop the rigger to the desired depth, and quickly adjust the drags to strike. I load my Marquesas with 50-pound and 65-pound spectra, with a 100-foot topshot of 25- to 30-pound monofilament. When a King takes my favorite spoon off of the release clip, I can get tight in a hurry! 3. Downrigger Release Clips: When fishing deep, you do not want any false releases. In other words, you don’t want the line to release from the clip due to water drag, when you are on your way down with the downrigger ball. To address this issue, I prefer the Pro Release downrigger releases when fishing any kind of gear. These releases only release from the fish side of the release and ensure that your gear can get down quickly without prematurely releasing. There are many ways to get bait down beneath the surface: planers, lipped lures, and using lots of lead are all options. But you’ll have a tough time finding someone skilled in the use of downriggers who doesn’t believe them to be an excellent tool in many circumstances for reaching deep fish. 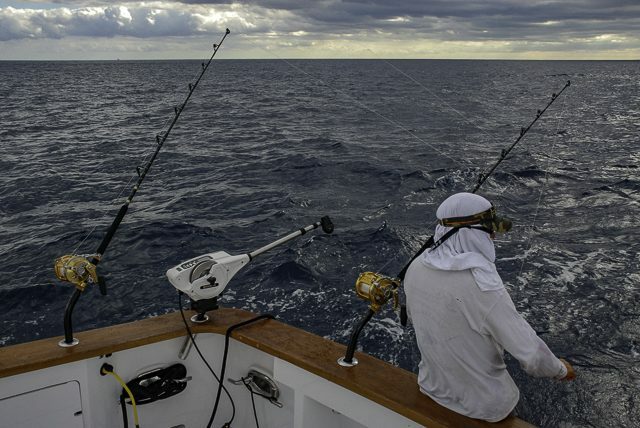 Throughout the years, as sportfishing has come of age, the sophistication of the tackle and techniques has kept improving. 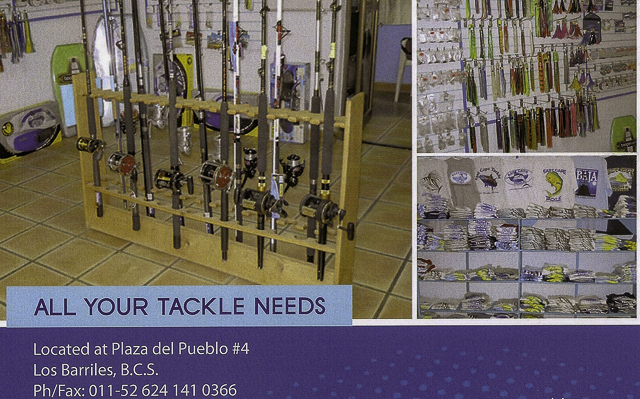 Slowly, very slowly, a small contingency of dedicated sportfishing tackle stores has emerged, filling the needs of the multitude of anglers who visit Baja, offering an unprecedented level of expertise and local knowledge to their clients. Many tackle manufacturers have assisted that small group of local, aspiring entrepreneurs that have sprung up as clients, stocking them with the “latest and greatest” fishing equipment for their customers. And, why not? The volume and variety of fish found in the waters off Baja provides a marvelous proving ground to test the many innovative products developed to improve sportfishing results. Finally, there are enough tackle shops scattered throughout Baja Sur to allow visitors to haul less tackle and to restock if necessary, or to select from new items that have received the seal of approval from local anglers and crews. 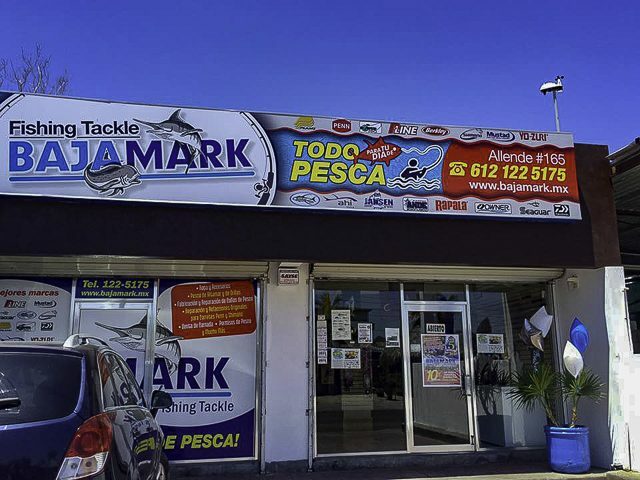 BajaMark Fishing Tackle opened in 2011 by Mark Callahan, a well-known competitor in Baja sportfishing tournaments. 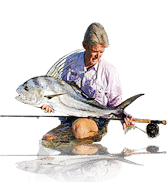 Callahan continues to enjoy the respect of his peers, as well as maintaining a reputation for having a well-run tackle store in La Paz with an extensive inventory of sportfishing equipment. 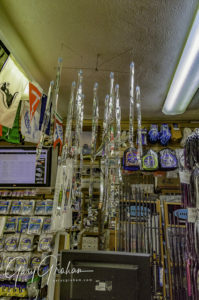 In 2009, East Cape Tackle was purchased by Cindy Kirkwood, from Calgary, Alberta, Canada, from Karen Kennedy, who had opened the store in 1996. Cindy soon doubled its size and continues the day-to-day management. She is always eager to offer her brand of local knowledge to both beginners and seasoned veterans. Soon after graduation from high school, Minerva Saenz Valenzuela met Bob Smith, a passionate fisherman who spoke of a small fishing village at the tip of Baja and who vowed that he would move there someday. In October of 1976, the two arrived in Cabo with a boat, NO PROBLEMA, and a small travel trailer crammed with their sparse belongings. They found a beautiful piece of property a few blocks from the beach where they parked their trailer and set up shop chartering the NO PROBLEMA. 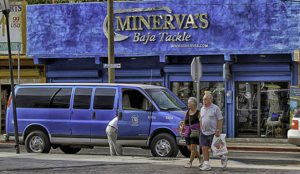 Not only has Minerva’s Baja Tackle continued to prosper, it has grown into one of the most respected businesses of its kind in Cabo, where sport fishermen can charter fishing boats, buy tackle, clothing or even have rods and reels repaired. Always on the leading edge, on a recent visit, Minnie insisted that I check out her extensive holographic dredges she has in stock now. When Stephen Jansen, a 6-foot, 3-inch Hollander, traveled to Baja in 1994, he succumbed to the siren’s call of fishing that could not be experienced in his homeland. He returned every summer and in 1998, he met his future wife, Monica Aragon in Cabo and they made a trip to Amsterdam in 1999 for their wedding. 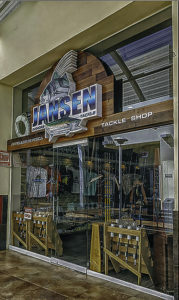 Upon their return to Cabo, they started their own tackle store that has become known for their custom designed “Cabo Killer” lures and Baja beach fishing expertise. The advantage of having reliable tackle shops that not only provide the luxury of rental tackle and a well-stocked inventory, but also local knowledge and insight, is priceless and undoubtedly an important “game-changer” for anglers, both local and visiting. In 2019, equipment is easy to come by. There is less hassle in packing your gear on flights, because of the excellent quality of tackle on most charter boats and the availability of stores along the way with modern tackle. The East and West Coast boats slowly changed the tackle and technique, improving on some, discarding others; and they continue to do so as they lure boats from other parts of the world into this fisherman’s paradise. It’s taken over fifty years to bring about the changes, so you and I can fly in, hop on a boat with all the equipment for a successful fishing trip, the envy of most of the rest of the world, and leave, knowing you probably could not have had a better trip anywhere, thanks to the many captains and crews who preceded you. So, keeping that in mind, enjoy your Baja fishing in 2019.